Robert Laurel Yupangco is undoubtedly very charming, rich, successful and a bachelor. His diverse business from Tourism to Finance industry made him received awards from different sectors. 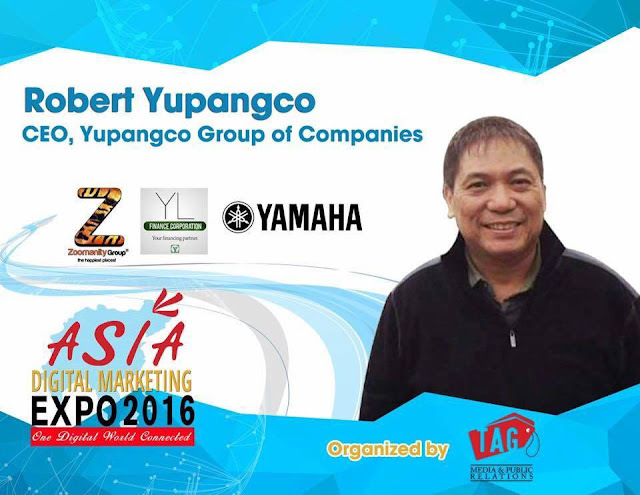 He will be one of the speakers this May 27, 2016, at Asia Digital Marketing Expo 2016 and will be there for 3 different activities; As the panel speaker, round table lead under the topic "The Digital Tourism" and as one of the incubator at the StartUp Pitching Session. The participation is and only because he can. He was a favorite in all speaking gig. That's also because of his wit, humor, and experience. Please read his message that will be published in the souvenir program of Asia Digital Marketing Expo 2016. “Timing is important!” Let me re-quote the English proverb: “The early bird catches the worm” but “The early worm was eaten by the bird”. We may act promptly but without a strategy, we may not get our desired results. Having a good and well-planned strategy is one key to coping up in the digital era that we are now facing. Technology change and consumer adapting to technology are drawing marketing innovators to fast face media platforms. Hospitality and tourism are one of the industries that are most affected by digital development. Technology enables a consumer to make better travel alternatives causing higher expectations. In order to perform well and gain competitive advantages, players in the travel industry, like us in Zoomanity Group are always looking for the newest and better ways to reach our customers. We are focusing on “real experience” through a real and live interaction with animals and nature. Zoomanity Group parks: Zoobic Safari in Subic, Residence Inn Tagaytay, Zoocobia in Clark, Pampanga, Paradizoo in Mendez, Cavite, Zoocolate Thrills in Loboc Bohol, are now expanding internationally through our projects in Nagano, Japan called Zootopia, a Ski and Summer resort park, and animal breeding center in Shepparton City in Victoria, Australia. To give our customers a better and easy way to visit our parks we’ve launched an online ticketing system called www.zoomanitypayment.com.ph. Change has been a vital part of our growing tourism industry, especially in digital aspect. The rising customer expectations give companies like us to have better opportunities to expand our market by giving a more quality and unique experience. TAG Media and Public Relations is the marketing & branding arm of Zoomanity Group. For more info: 09166299381.